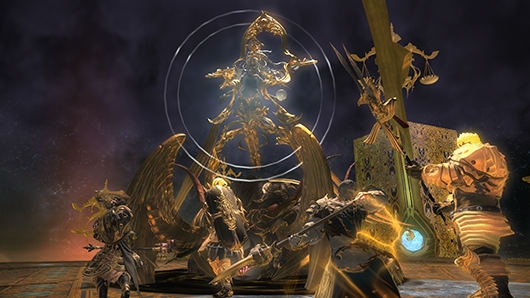 Disciple of War or Magic level 60 The Pillars (X:11.5 Y:11.2) House Fortemps Knight Players must first complete the main scenario quest "Floor the Horde." 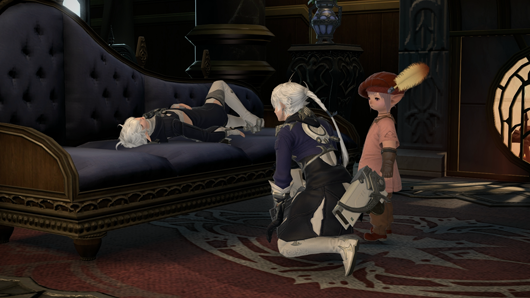 Disciple of War or Magic level 60 Fortemps Manor (X:6.1 Y:6.0) Alphinaud Players must first complete the main scenario quest "Promises Kept." Disciple of War or Magic level 60 ??? ??? 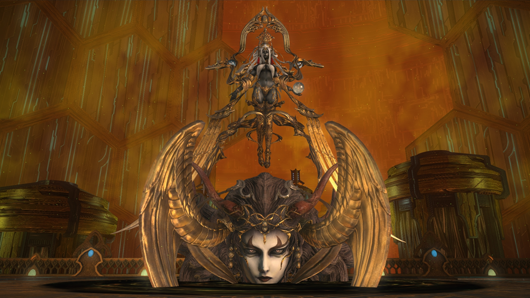 Players must first complete the main scenario quest "Shadows of the First." Disciple of War or Magic level 60 ??? ??? Players must first complete the main scenario quest "???" Disciple of War or Magic level 60 ??? ??? Players must first complete the main scenario quest "???" New Chronicles of a New Era quests have been added. Disciple of War or Magic level 60 The Dravanian Hinterlands (X:21.7 Y:18.8) Mide Players must first complete the quest "A Gob in the Machine." 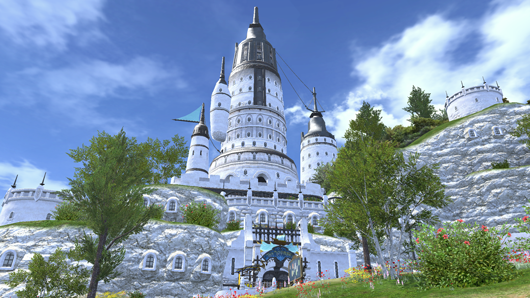 Disciple of War or Magic level 60 The Dravanian Hinterlands (X:23.5 Y:23.9) Biggs Players must first complete the quest "The Coeurl and the Colossus." Disciple of War or Magic level 60 The Dravanian Hinterlands (X:21.5 Y:19.5) Biggs Players must first complete the quest "Biggs and Wedge's Excellent Adventure." Disciple of War or Magic level 60 The Dravanian Hinterlands (X:21.7 Y:18.8) Biggs Players must first complete the quest "Thus Spake Quickthinx." Disciple of War or Magic level 60 The Rising Stones (X:6.1 Y:5.2) Unukalhai Players must first complete the quest "The Fate of Stars." Disciple of War or Magic level 60 The Rising Stones (X:6.1 Y:5.2) Unukalhai Players must first complete the quest "Balance unto All." New side story quests have been added. Disciple of War or Magic level 60 The Pillars (X:8.7 Y:7.8) Briardien Players must complete the side quest "More than Meets Her Eye." Disciple of War or Magic level 60 Saint Endalim's Scholasticate (X:6.2 Y:5.9) Saturnois Players must complete the side quest "Divine Reckoning." Disciple of War or Magic level 60 The Pillars (X:8.7 Y:7.8) Briardien Players must complete the side quest "Through the Grapevine." Disciple of War or Magic level 60 The Pillars (X:8.7 Y:7.8) Briardien Players must complete the side quest "A Familial Resemblance." Disciple of War or Magic level 60 Foundation (X:9.9 Y:11.4) Cyr Players must complete the side quest "The Measure of a Mammet." 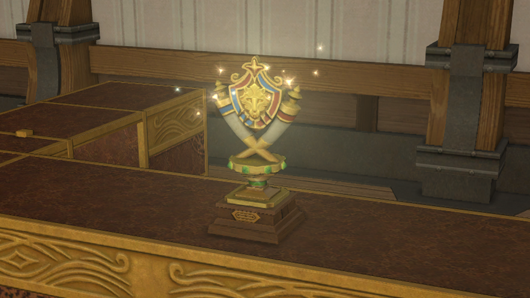 The FATE requirement for the quest "Trials of the Braves" has been changed from obtaining a gold medal to only completion of the FATE. 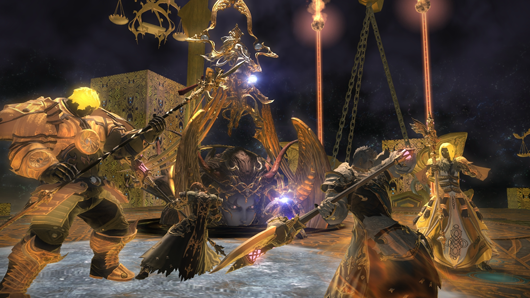 The Allagan tomestones required to create and enhance Anima Weapons have been changed from tomestones of law to tomestones of lore. 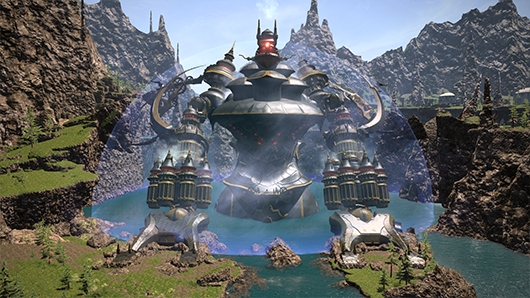 Disciple of War or Magic level 60 Idyllshire (X:7.0 Y:5.9) Unctuous Adventurer - New Grand Company quests have been added. 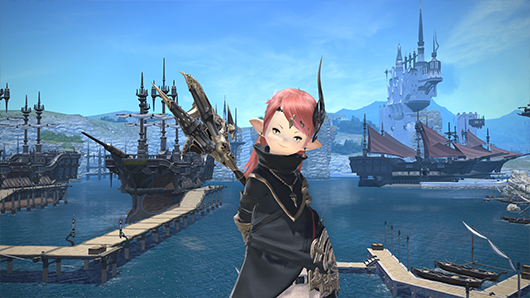 Disciple of War or Magic level 47 Limsa Lominsa Upper Decks (X:13.1 Y:12.7) Storm Personnel Officer Players must complete the side quest "Rising to the Challenge." Disciple of War or Magic level 47 New Gridania (X:9.8 Y:11.0) Serpent Personnel Officer Players must complete the side quest "Rising to the Challenge." 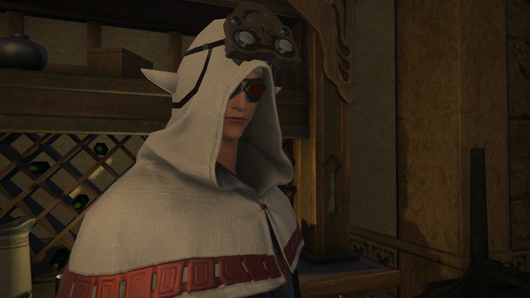 Disciple of War or Magic level 47 Ul'dah - Steps of Nald (X:8.3 Y:9.1) Flame Personnel Officer Players must complete the side quest "Rising to the Challenge." * Please note that players must have first achieved a rank of second lieutenant or higher with their Grand Company. 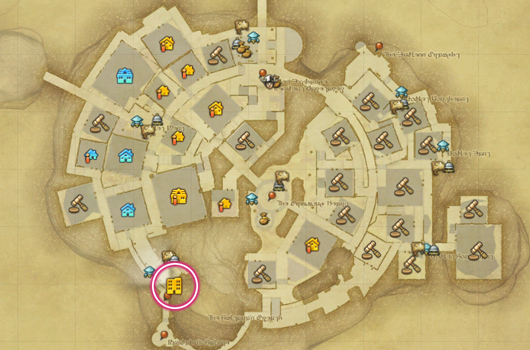 The location of certain NPCs in the Moogle beast tribe quest "From Lax to Max" have been adjusted. 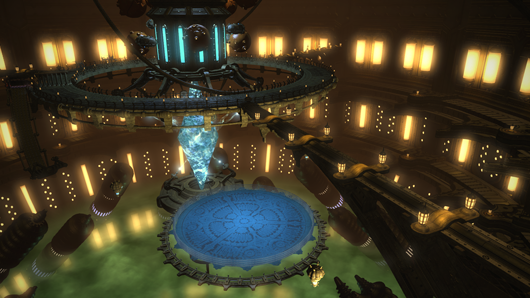 New items can now be purchased from the Amalj'aa, Ixali, and Vanu Vanu beast tribe vendors. 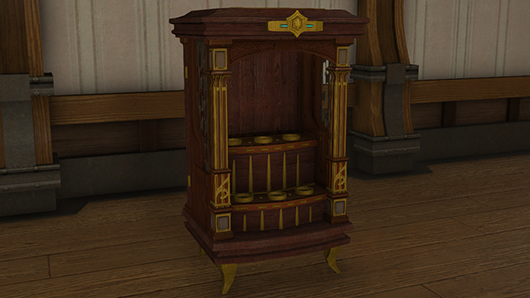 The types of Allagan tomestones obtained from wyvernskin and dragonskin treasure maps have been adjusted. Rewards have been added and adjusted. 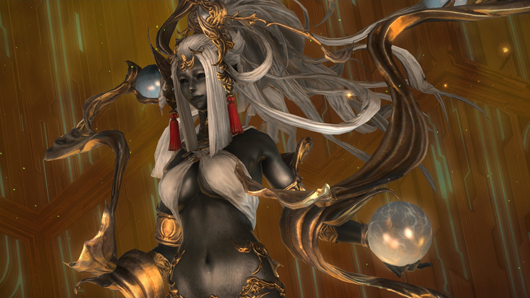 The types of Allagan tomestones that can be obtained have been adjusted. 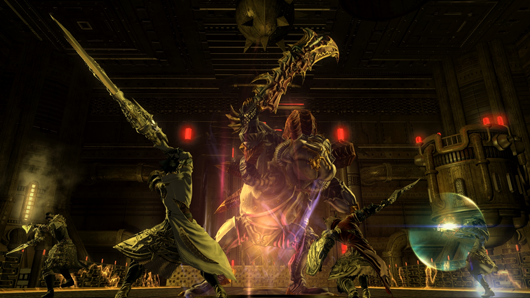 The cutscene shown when doors unlock has been adjusted. 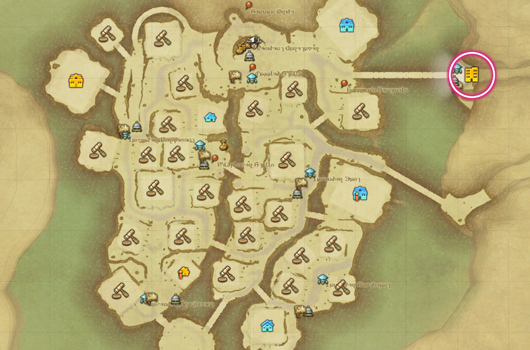 New monster spawning patterns have been added. 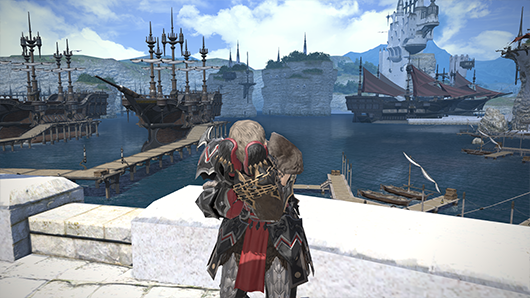 Players can now be promoted to first lieutenant in their respective Grand Companies. Once promoted, the company seals cap will be increased from 50,000 to 80,000 company seals. 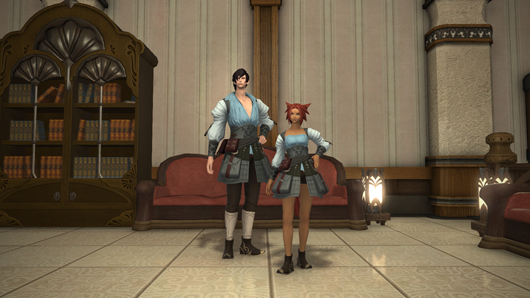 With the introduction of a new Grand Company rank, new items have been added to the Grand Company quartermasters. Players can now take command of soldiers in their respective Grand Companies with adventurer squadrons. After assembling a sufficient number of NPC recruits, players can deploy a squadron of soldiers on special missions, reaping rich rewards upon their successful return. Apartments are now available in all three residential districts. The interior, flooring, and ceiling lights of apartments can be customized in the same way as estate halls. An apartment building is available in every ward in the three residential districts, with a second apartment building available in each subdivision. Each apartment building also contains a lobby where players can speak with a receptionist, as well as mender and material supplier NPCs. 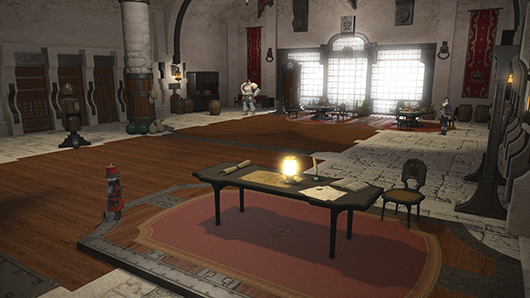 Players can place up to 50 furnishings in an apartment. 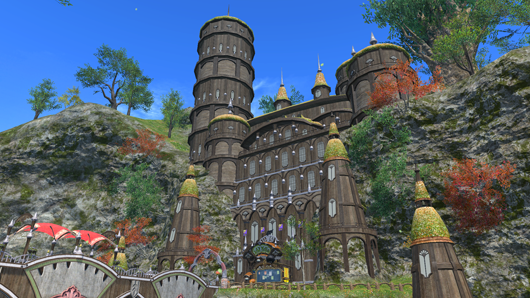 As with free company and personal estates, players are able to use all housing-specific features such as flowerpots, the orchestrion, the armoire, the crystal bell, summoning bells, and the employ of NPCs. 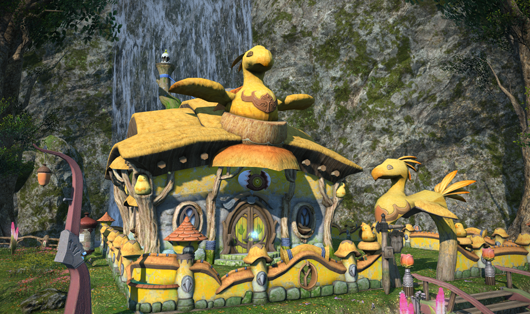 Each apartment building also includes a chocobo stable, which is shared with all tenants. 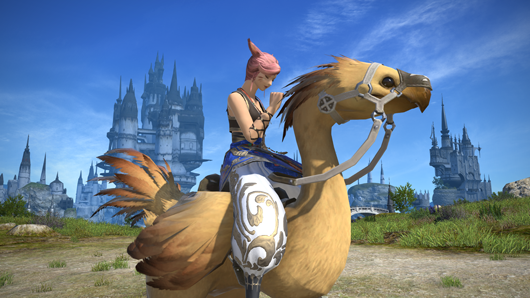 Here players can train their chocobos and change their color, and also assist in training other tenants' chocobos. It is also possible to teleport directly to your apartment. 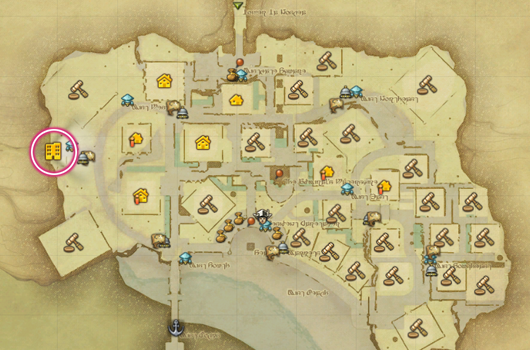 Furthermore, a summoning bell and market board have also been placed close to the building for convenience. New furnishings have been added. 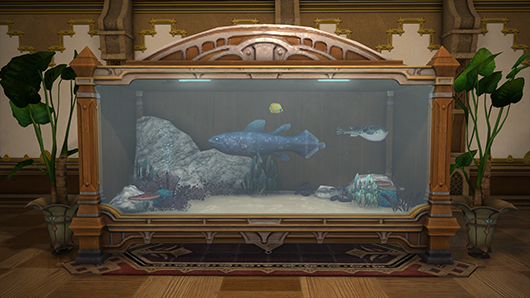 When preparing an aquarium for fish, players can choose the type of water to fill the tank, as well as add an accessory for decoration. 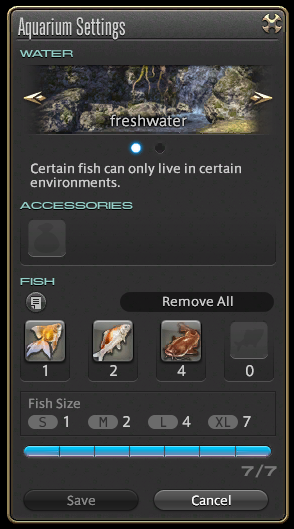 Before placing fish in an aquarium, players may choose to fill the tank with either freshwater or saltwater. This will dictate which types of fish can be placed in the aquarium. 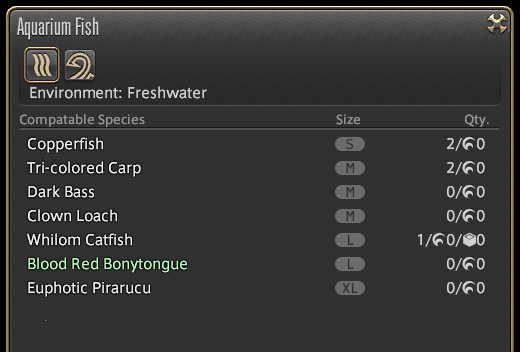 Please be advised that, in order to change the water type, any fish in the tank must be removed. Accessories can be used to change the appearance of the water tank. * Please be advised that any fish removed from the aquarium will be lost. Fish have been categorized into four sizes: small, medium, large, and extra large. It is worth noting that larger fish will occupy more space in an aquarium, leaving less room for other fish. A tooltip has been added to display the titles of songs that appear cut off. 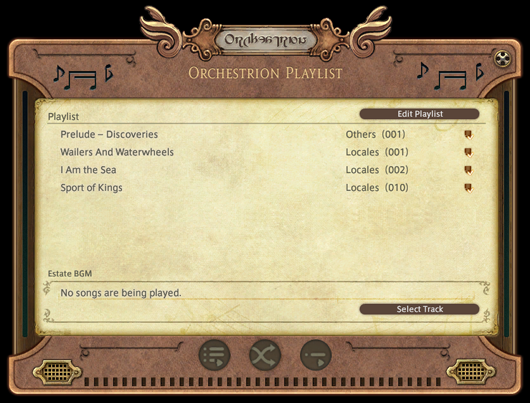 A playlist function has been added to the orchestrion. * In accordance with this change, the orchestrion UI has been redesigned. * Playlists cannot be accessed from inns. Upon accessing the orchestrion, the playlist interface will be displayed. Players can select up to eight songs to be registered to the playlist at any given time. The playlist can be edited at any time to change the order or listing of songs to be played. Please note that it is possible for more than one person to access the playlist at the same time. * In the event another player edits the playlist while you are still viewing it, the interface will be closed and any music playing will stop to allow the playlist to be updated. Plays all songs registered to the playlist in the order they were registered. Plays all songs registered to the playlist in a random order. No song will be repeated until all songs have been played. Plays the selected song on loop. Should you wish to play a single song not registered to the playlist, the Select Track button at the bottom of the interface will display a separate window listing all songs registered to the orchestrion. 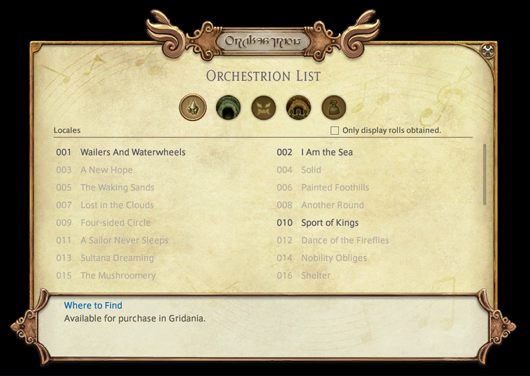 The title of songs you have yet to acquire will now be displayed in the orchestrion's song list. The All tab of the orchestrion has been removed. The following additions have been made to gardening. A new seed for flowerpots has been added. 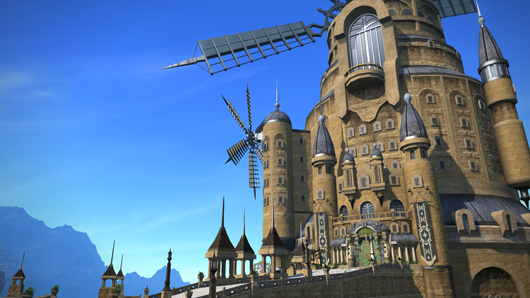 Players can now purchase a materia melder permit for their estates. 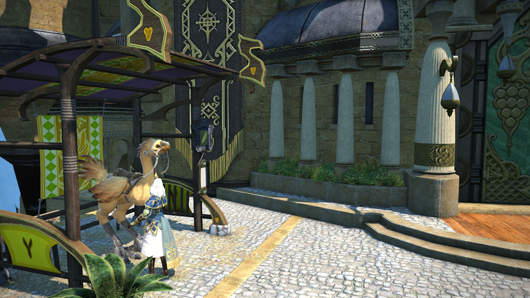 A compact level 6 aetherial wheel stand has been added, possessing the same capabilities of a normal level 6 aetherial wheel stand. 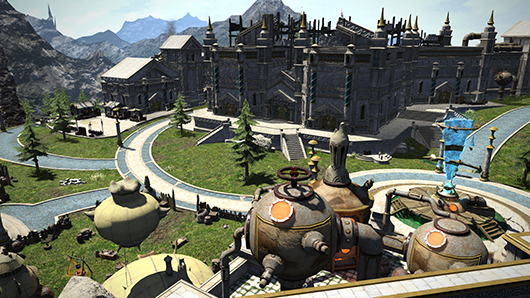 Players can exchange level 6 aetherial wheel stands for compact ones by speaking with the Resident Caretaker NPC in each residential districts. The Triple Triad Battlehall has been added. New prizes are available for purchase using MGP. Wondrous Tails has been added. Khloe Aliapoh fears her stories are not quite what they used to be, as they no longer seem to lift the spirits of her troubled friend. 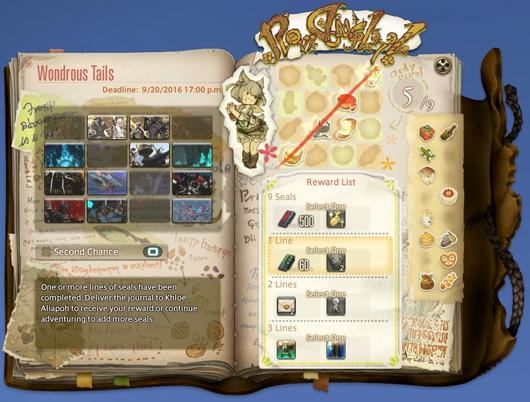 Take up Khloe's journal, the Wondrous Tails, and fill it with pages of your own adventures, that she might be inspired to write new stories of her own! 1. Receive a Wondrous Tails journal. 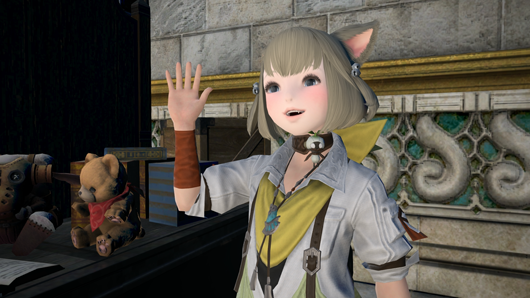 Speak with the NPC Khloe Aliapoh in Idyllshire (X:5.7 Y:6.1) to receive a journal containing sixteen objectives. Please note that no two players will have all of the same objectives. * A new journal will be available from Khloe Aliapoh every week on Tuesday at 1:00 a.m. (PDT). 2. Complete objectives to obtain seals. Upon completing the objectives corresponding to the squares in the journal, you will receive up to nine seals at random that can be added to your journal. * You can only receive one seal per objective. 3. Hand in the Wondrous Tails journal. When you have received nine seals for your journal, deliver it to Khloe Aliapoh, and she will reward you accordingly. 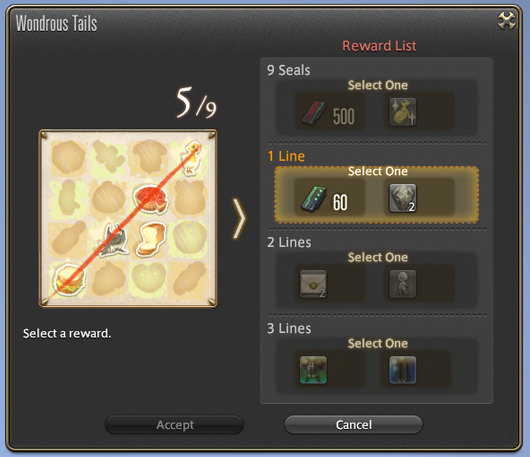 You will receive a base reward for obtaining nine seals, and additional rewards for completing rows horizontally, vertically, or diagonally. A Wondrous Tails journal can only be kept for two weeks„Ÿstarting from the Tuesday when it was first issued„Ÿbefore it must be handed in for a reward. * In the case you exceed the reward period for a Wondrous Tails journal, you may speak with Khloe Aliapoh to exchange it for a new one. When you complete an objective with one or more party members who are new to the duty, you will receive one Second Chance point. You can receive up to nine points, which can be used as described below. 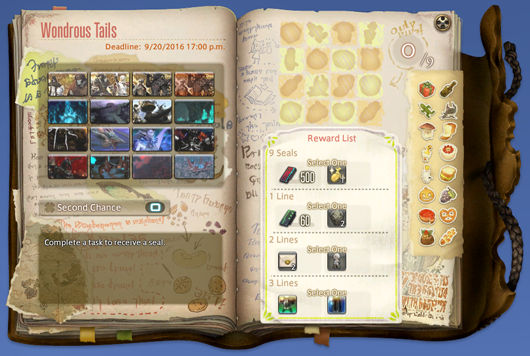 * Once you have unlocked Wondrous Tails, it is possible to receive Second Chance points even if you do not currently possess a journal. * You will only receive one Second Chance point per objective even if more than one party member is new to the duty. * Second Chance points can only be obtained from duties that offer bonuses when one or more players are new to the duty. RetryRestore the status of a completed duty to incomplete, while rendering the status of an incomplete duty to complete. ShuffleShuffle the position of all seals in the journal. * Only available when current seal count is between three and seven. The Wondrous Tails category has been added. 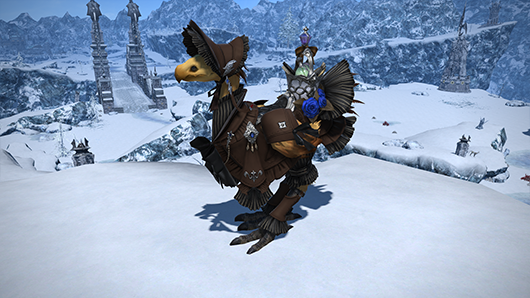 Certain foods and medicines can be used while riding a mount. 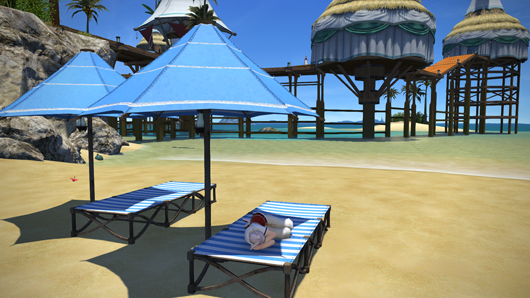 * In accordance with this change, beach beds have been set in Costa del Sol. 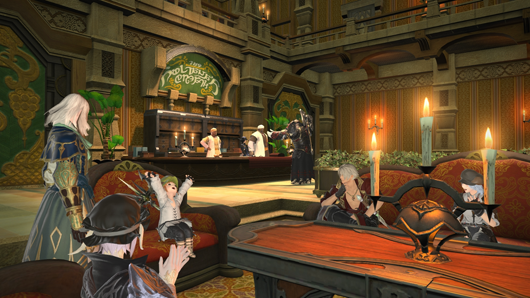 The Pray emote can now be used when sitting on the ground, sitting in chairs, and when riding mounts. * No changes have been made to the emote motion when standing. The Pose emote motion for male Highlanders has been changed. The original Pose emote motion will now be used with the new Flex emote, which can be used by all races. Using the Huzzah, Battle Stance, or Victory emotes while your weapon is drawn will automatically sheathe your weapon when the emote animation ends. * Disabling the setting "Auto-sheathe weapon when not in battle" in the Character Configuration interface will allow you to keep your weapon unsheathed. 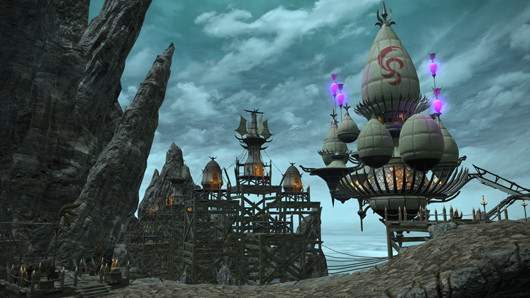 New structures have been added to Idyllshire. 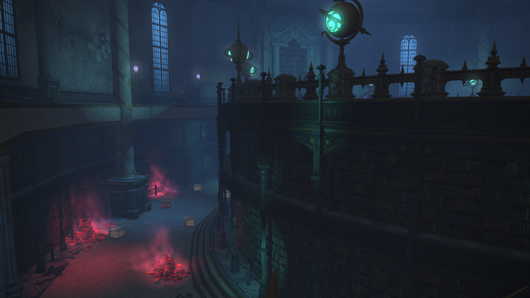 A new raid dungeon has been added. Containment Bay P1T6 (Extreme) can only be accessed via the Raid Finder. 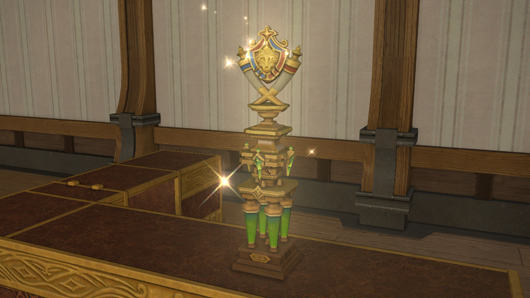 Disciple of War or Magic level 60 The Rising Stones (X:6.1 Y:5.2) Unukalhai Players must first complete the quest gBalance unto All.h A new trial has been added. and there's more on the list! !